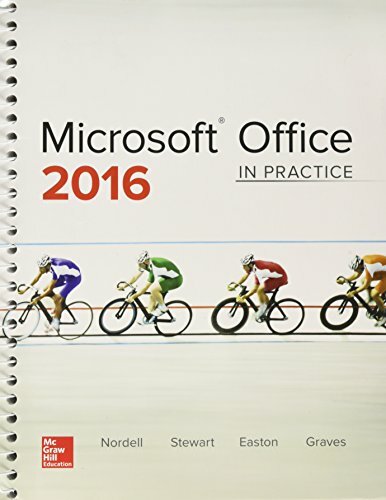 Microsoft Office 2016: In Practice offers a fresh approach to teaching today’s students Microsoft Office skills by clearly introducing skills in a logical sequence: 1) Topic 2) Instruction and 3) Practice. Nordell’s T.I.P.s approach builds a foundation for success by helping students practice what they learn, and provides transferable skills that allow students to grasp critical thinking beyond the textbook assignment. In Practice seamlessly integrates with SIMnet Online, McGraw-Hill Education’s learning and assessment solution, which has 1:1 content to help students practice and master computing concepts and Microsoft Office skills. In Practice projects in SIMgrader allow students to practice their skills in a live Office application. Students receive immediate feedback upon completion of these auto-graded projects. The integration of In Practice with SIMnet helps to meet the diverse needs of students and accommodate individual learning styles.